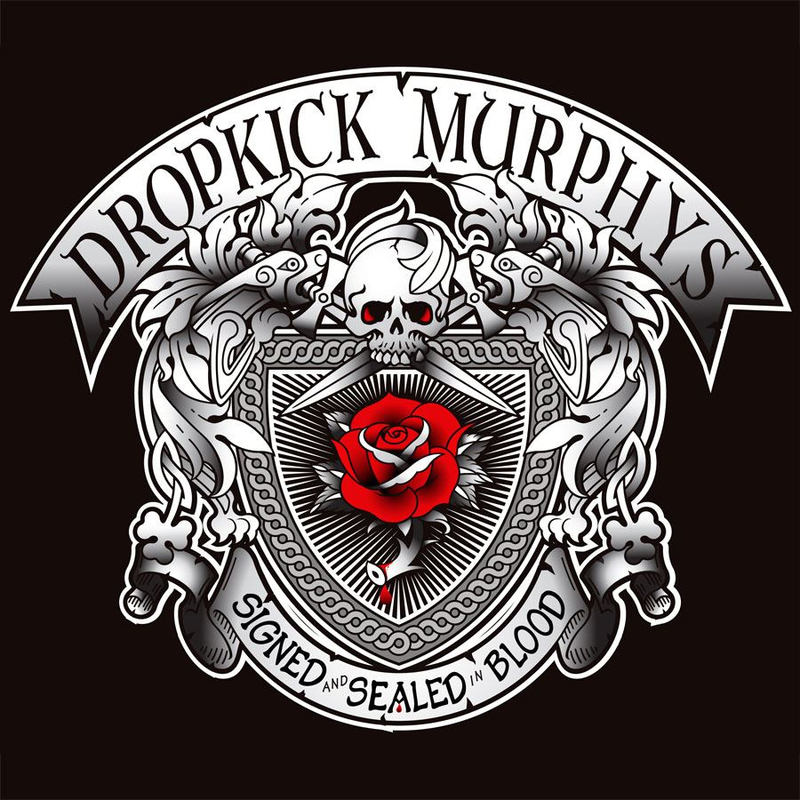 Signed and Sealed in Blood is the Dropkick Murphys 8th album overall and if you’re familiar with their previous output then you’ll already have a rough idea of what you’re in for. But for those not in the know, the septet mixes bagpipes, acoustic guitars, whistles and accordions among other instruments with the standard punk rock format of guitar, bass and drums to forge an unforgettable and explosive listening experience. Sonically, the majority of the songs are still firmly rooted in the folk punk style that they have become known for, but this time around there seems to be a stronger emphasis on creating the most glorious gang shouts and infectious hooks possible. The album features a few folk-centric songs that bring the folk instrumentation to the centre of the stage and Out on the Town even allows for a chirpy whistling break mid-song. All of this makes for a subtle, yet noticeable change in composition that allows the band to retain their trademark attitude and personality, all while branching out enough to keep their well-defined style fresh and interesting. The vocals are clearly sung, spluttered, shouted, bellowed and chanted by 6 of the 7 band members over the course of the album. Lyrics tend to revolve around drinking, celebrating, unity and situations in life as told through fictional characters. The best example of this is in The Seasons Upon Us, a sarcastic caricature of a dysfunctional family that recounts their miserable annual Christmas gathering and is guaranteed to leave you grinning. It’s worth noting that while being a Christmas song, albeit unconventional, the way in which the lyrics are written make it timeless so that it can enjoy at any time of the year and not just when the Christmas season comes around. The band tones back the cacophony on occasion but they rarely slow down the tempo significantly. The exception to this trend is End of the Night, a somewhat sombre sounding song that lets the listener know that the album is coming to its end. It features a rare appearance of the piano, not the most commonly used instrument in their arsenal, which is also used on Don’t Tear Us Apart to create a memorable opening and makes another small appearance later during the bridge. Signed and Sealed in Blood is packed full of memorable choruses, catchy hooks and a passionate, energetic performance that blends 2 distinct genres, several singing styles and a variety of instruments into just over 40 minutes, which prevents it from overstaying its welcome. It will keep you coming back for more listen after listen and because of this, it could already be on its way to becoming one of the best albums of 2013.